For many parents, schools that offer full day Kindergarten programs is a blessing. Particularly for working parents. Kindergarten provides children with an opportunity to learn at an early age. This is always a good thing, right? I noticed a great change between the Kindergarten of today and yester years. My oldest son is in college. He attended a full day K program circa approx 1998. It was wonderful experience for him. He came home daily in a great mood and learned alot. But, I recall that they also played alot as well. My youngest, 7, started Kindergarten last year he is now in first grade. Of course, instruction is now aligned to Common Core and my youngest son is tested frequently often on the computer. Every 2 – 3 weeks the children have a unit test in fill in bubble format for math as test prep. They take computerized tests, quizzes and use Smartboards and Ipads more often than not. My 7 year old really enjoys school, he loves his teacher and he has some very nice friends in his class. I am greatful for all those things. He comes home everyday and every day I ask him how his day was. Every day he gives me the scoop and responds that it was fine and that he learned alot and there was a lot of classwork. But, I noticed that he rarely speaks of play. The children in my district are permitted 20 minutes for recess and 20 minutes for lunch start to finish, including seat time but thats it. All other hours of the school day is micromanaged to provide instruction and/or specials aligned to the common core. When he was in Kindergarten, Tyler came home with a HW assignment that required him to count and write the number of “vertices” each of the shapes. Well, Im embarassed to say, I had to look that term up. He spoke of composing and decomposing numbers. He told me all about oviparus animals. I was impressed that my Kindergartner knew all these fancy shmancy words! He was expected to write full sentences and learned reading and writing through Fundations learning. He wrote out sentences and pages and pages throughout his Kinder year and this year is no different. First grade is twice as rigorous..
Gone are the days of coloring, ABCs, counting numbers, legos and block play. Hello, CC test prep and touchscreens! The Kindergarten work is certainly more “rigorous”. But, with that rigor comes consequence. He is a wonderful child. But, he is often tired, moody and sometimes yes….he comes home very stressed. His lunch box comes home daily packed with food that he didnt even have time to eat. As a parent, I notced a stark difference between the schooling my eldest child recieved and the one my youngest is embarking on. And, it makes me worry and wonder what is in store for him. “We have to front-load education when children are young “ said a Buffalo school board member regarding Kindergarten. Cancelling Kindergarten plays to make more time for college and career readiness is a dead give away that the days of coloring, legos and block play in Kindergarten is over. Indeed, I just wanted to share with my readers a few pictures that speak volumes about instruction in our classrooms today. 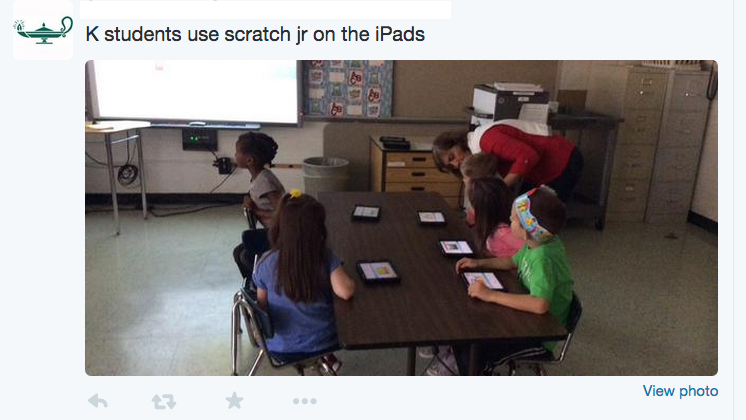 The following 2 pics are from my districts Twitter feed -as you can see, this represents the new normal in Kindergarten. Dont get me wrong, I firmly believe in high standards and want my child to feel challenged, but I cant help but wonder where play fits in to education these days, or if it does at all? 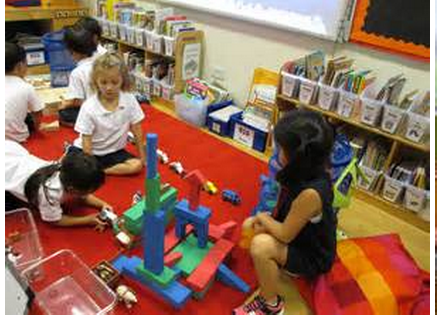 What do you think when you see these pictures of the new normal in Kindergarten ? 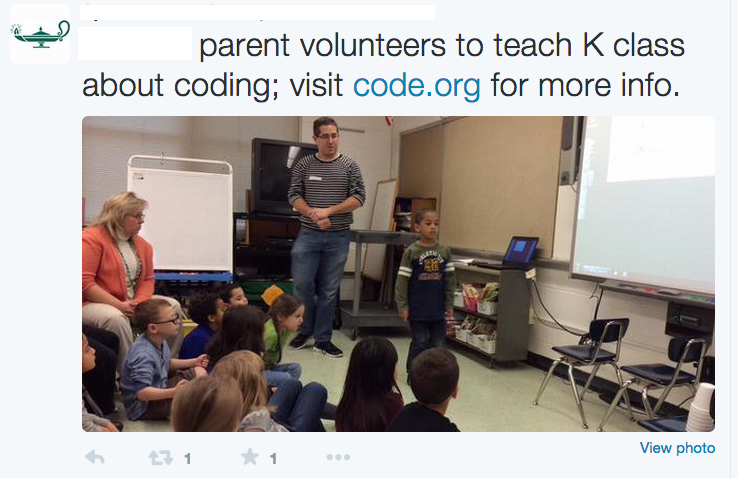 I think its great kids are learning to code. But, in Kindergarten? What happened to imaginative play? Blocks? Legos? Drawing and coloring? The powerful ideas found in Dr. Kamii’s paper are echoed in the recent essay released by Defending the Early Years in April, 2015 called Lively Minds: Distinctions between academic versus intellectual goals for young children by Dr. Lilian G. Katz (Katz, 2015). Dr. Katz is Professor Emerita of Early Childhood Education at the University of Illinois (Urbana-Champaign). Dr. Katz is Past President of the National Association for the Education of Young Children, and the first President of the Illinois Association for the Education of Young Children. She is an influential leader in the field of early childhood education. 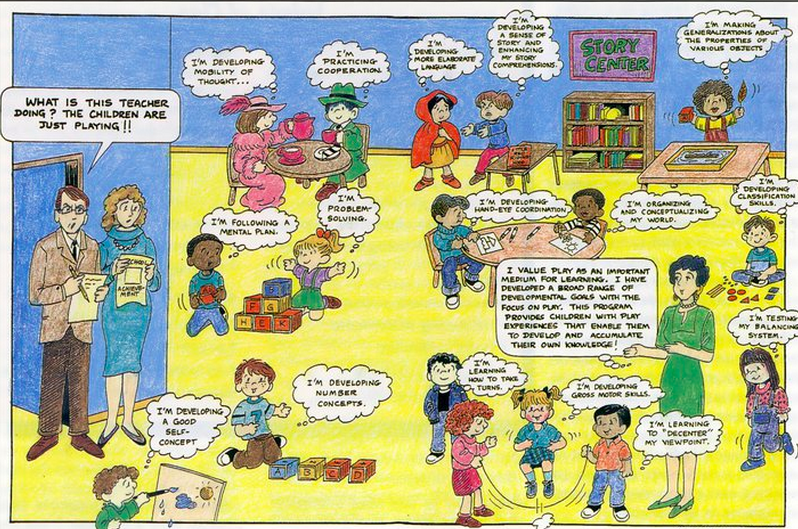 In Dr. Katz’s paper, she explains the importance of intellectual goals for young children and contrasts them with academic goals. Intellectual goals and their related activities are those that address the life of the mind in its fullest sense – reasoning, predicting, analyzing, questioning – and include a range of aesthetic and moral sensibilities. Academic goals, on the other hand, involve mastery of small discrete elements of disembodied information designed to prepare children for the next levels of literacy and numeracy learning. Items designed to meet academic goals rely heavily on memorization and the application of formulae versus understanding. As Dr. Katz explains, intellectual dispositions may be weakened or even damaged by excessive and premature focus on academic goals. Indeed, a recent study by a team from the Children’s Digital Media Center in Los Angeles explores what happened to a group of sixth-graders who attended a nature camp without any digital media available for five days. No cellphones, no iPhones, no laptops, no computers, and no television. As written about in the New York Times, the researchers found that the children who spent just five days without screens scored higher on tests in which they were asked to interpret the facial expressions of either people in photographs, or people in videos without sound, than did children who had no such break from technology. Which begs the question: is all this common core and technology really good for our kids? The American Academy of Pediatrics advises on the importance of play and believes that schools should ensure that students enjoy opportunities for play. Play is essential to development because it contributes to the cognitive, physical, social, and emotional well-being of children and youth. 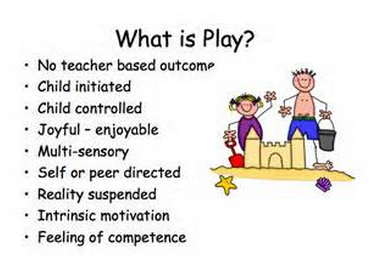 Play also offers an ideal opportunity for parents to engage fully with their children. Despite the benefits derived from play for both children and parents, time for free play has been markedly reduced for some children. This report addresses a variety of factors that have reduced play, including a hurried lifestyle, changes in family structure, and increased attention to academics and enrichment activities at the expense of recess or free child-centered play. This report offers guidelines on how pediatricians can advocate for children by helping families, school systems, and communities consider how best to ensure that play is protected as they seek the balance in children’s lives to create the optimal developmental milieu. In 2006, Sir Ken Robinson, an author and expert on innovation and creativity in education and business, gave a TED talk titled “How Schools Kill Creativity” that became the most watched in TED’s history with more than 25 million views on the TED website and more than 6 million on YouTube. If you haven’t watched it, here it is. 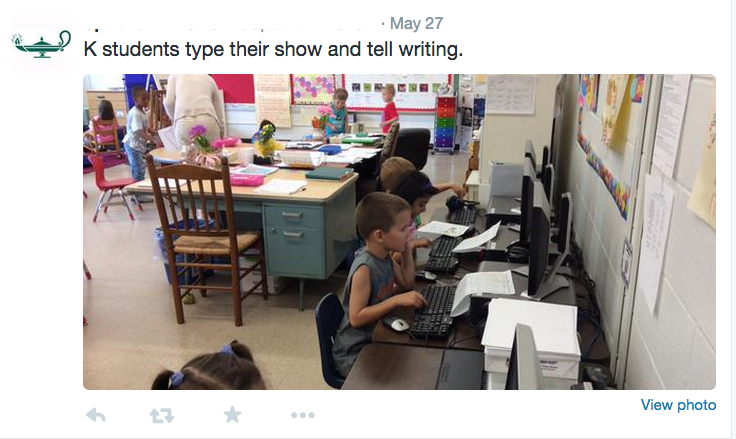 The picture of little kindergartners forced to sit still at the computer and concentrate solely on what is happening on the screen in front of them certainly resonates with me. This cultre is most telling. Children are growing up without being provided the opportunity to simply be a child. 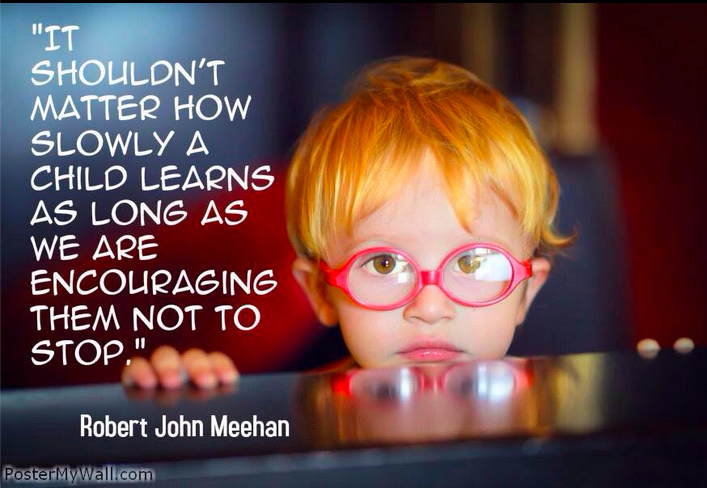 Which begs the question, why not let children learn through play? TWENTY years ago, kids in preschool, kindergarten and even first and second grade spent much of their time playing: building with blocks, drawing or creating imaginary worlds, in their own heads or with classmates. But increasingly, these activities are being abandoned for the teacher-led, didactic instruction typically used in higher grades. In many schools, formal education now starts at age 4 or 5. Without this early start, the thinking goes, kids risk falling behind in crucial subjects such as reading and math, and may never catch up. The idea seems obvious: Starting sooner means learning more; the early bird catches the worm. But a growing group of scientists, education researchers and educators say there is little evidence that this approach improves long-term achievement; in fact, it may have the opposite effect, potentially slowing emotional and cognitive development, causing unnecessary stress and perhaps even souring kids’ desire to learn. The stakes in this debate are considerable. As the skeptics of teacher-led early learning see it, that kind of education will fail to produce people who can discover and innovate, and will merely produce people who are likely to be passive consumers of information, followers rather than inventors. Which kind of citizen do we want for the 21st century? In the United States, more academic early education has spread rapidly in the past decade. Programs like No Child Left Behind and Race to the Top have contributed to more testing and more teacher-directed instruction. Another reason: the Common Core State Standards, a detailed set of educational guidelines meant to ensure that students reach certain benchmarks between kindergarten and 12th grade. Currently, 43 states and the District of Columbia have adopted both the math and language standards. The shift toward didactic approaches is an attempt to solve two pressing problems. By many measures, American educational achievement lags behind that of other countries; at the same time, millions of American students, many of them poor and from minority backgrounds, remain far below national norms. Advocates say that starting formal education earlier will help close these dual gaps. But these moves, while well intentioned, are misguided. Several countries, including Finland and Estonia, don’t start compulsory education until the age of 7. In the most recent comparison of national educational levels, the Program for International Student Assessment, both countries ranked significantly higher than the United States on math, science and reading. Of course, these countries are smaller, less unequal and less diverse than the United States. In such circumstances, education poses fewer challenges. It’s unlikely that starting school at 7 would work here: too many young kids, disadvantaged or otherwise, would probably end up watching hours of TV a day, not an activity that promotes future educational achievement. But the complexities of the task in this country don’t erase a fundamental fact that overly structured classrooms do not benefit many young children. Some research indicates that early instruction in reading and other areas may help some students, but these boosts appear to be temporary. A 2009 study by Sebastian P. Suggate, an education researcher at Alanus University in Germany, looked at about 400,000 15-year-olds in more than 50 countries and found that early school entry provided no advantage. Another study by Dr. Suggate, published in 2012, looked at a group of 83 students over several years and found that those who started at age 5 had lower reading comprehension than those who began learning later. Other research has found that early didactic instruction might actually worsen academic performance. Rebecca A. Marcon, a psychology professor at the University of North Florida, studied 343 children who had attended a preschool class that was “academically oriented,” one that encouraged “child initiated” learning, or one in between. She looked at the students’ performance several years later, in third and fourth grade, and found that by the end of the fourth grade those who had received more didactic instruction earned significantly lower grades than those who had been allowed more opportunities to learn through play. Children’s progress “may have been slowed by overly academic preschool experiences that introduced formalized learning experiences too early for most children’s developmental status,” Dr. Marcon wrote. Over the past 20 years, scientists have come to understand much more about how children learn. Jay Giedd, a neuroscientist at the University of California, San Diego, has spent his career studying how the human brain develops from birth through adolescence; he says most kids younger than 7 or 8 are better suited for active exploration than didactic explanation. “The trouble with over-structuring is that it discourages exploration,” he says. Reading, in particular, can’t be rushed. It has been around for only about 6,000 years, so the ability to transform marks on paper into complex meaning is not pre-wired into the brain. It doesn’t develop “naturally,” as do other complex skills such as walking; it can be fostered, but not forced. Too often that’s what schools are trying to do now. This is not to suggest that we shouldn’t increase access to preschool, and improve early education for disadvantaged children. But the early education that kids get — whatever their socioeconomic background — should truly help their development. We must hope that those who make education policy will start paying attention to this science. Reblogged this on tmgrocki's blog.